What did you come here to do? What is that thing at the core of your being that most vividly expresses who you are? Did you come to dance with confident abandon? Did you come to nurture others? Did you come to make the world more beautiful with your art, with your poetry, with your song? What drives you? What pulls you? What moves you along the road of challenge and growth and expansion? Are you driven by connection? Are you drawn to success? How do you know you have succeeded? Are you wired for love? I know this about myself: Love is what guides me, it is my North Star. In everything and always. Love is at the heart of all that matters to me. I think I have always know this at my core; but at this time, in this place, I am sure. In the weeks leading to our wedding, my husband and I were asked by a Jewish teacher, What is the one word that best describes the other person for you? My husband, in my eyes, was calm. To him, I was caring. I believe in these, believe that they are more than just a representation of what each of us needed from the other. Beatles music was the anthem of my childhood. I spent hours lying belly down on the shag carpet of our living room, Beatles songs playing while I looked at every detail of their vinyl album covers and followed along with the lyrics. George Harrison was my favorite, for me the most handsome Beatle. I preferred Paul’s voice to John’s, but some of John’s songs were my favorites. I could sing along to practically every song on every album with every member of my family. We always joined together on the shoop in Come Together, no matter where we were in our one-story house, where the walls were paper thin and sound traveled freely. I remember shooping together in the car on road trips when I was very little in France. I took to heart John’s reminder that love is all you need. Paul guided me to let it be when life felt heavy. Rocky Raccoon would invoke images in my mind inspired by the westerns I watched on TV with my dad. One day I might have to write a book titled, The Story of My Life in Beatles Songs, something like the Sgt. Pepper movie from 1978, which caused a short-lived crush on Peter Frampton when it played on TV in fourth grade. In the months after my daughter Tikva died 58 days after she was born, we asked each other what should go on her headstone besides her name and the dates of her short but huge life. As the mother of a dead child, creating my daughter’s headstone was a way in which I could express my love, a way I could still mother her, call out to the universe that she will always be my child. A way of honoring the greatest lesson she taught me – I believe the most important lesson I will ever learn: how to love unconditionally. The Beatles had played in the children’s hospital OR the day the doctors took our fragile daughter to another floor for an echocardiogram. Hey Jude, Let It Be, and All You Need Is Love, one song after another guiding the medical team. Her eyes were open so wide during that procedure as she experienced the shock of being in a place that wasn’t her small warm bed in the NICU, doctors and nurses all around her. I was afraid for her, I wanted to hold her and comfort her, put her at ease – something I couldn’t do because she was in such fragile condition most of the time and even a mama’s hug could do her harm. I had to step back against the wall and let the doctors do their job in that room. So I stood back and listened to the music. I listened to Paul’s reminder and thought about the irony that a Jewish girl would feel such a connection to Mother Mary because of her lifelong connection to a song. I focused on love and I watched my tiny daughter in that big space, and I looked at my husband who had also been listening beside me. Of course the Beatles are playing, my husband’s eyes told me. Of course, my eyes spoke back. I rely on love with every fiber of my being. I rely on the love of others who have guided my way through their example and caring for almost 44 years. I rely on the love within to strengthen me during trying times. I rely on the love that I am in order to find my way forward. I try to shine love, reflect love, be love. Sometimes I forget. Other times I remember. I know I have succeeded when I feel peaceful, trusting, connected. I traveled back home with my family recently to celebrate Passover with everyone. Back home is where I grew up, where my husband grew up, where our daughters were born. It’s where most of our extended families live. Back home is familiar, the place that will always hold a piece of my heart. Back home is one of the most beautiful places on earth – I will never deny that. But it’s not the place that pulls me anymore, because for me home is where I am now, where my husband and children are, where we have made our home. What pulls me now about back home is our family and those I call my framily. My people whom I’ve loved for a very long time. And the Pacific Ocean. I went with my father to visit Tikva’s grave during our visit. It was a sunny spring day with only a few clouds in the blue sky and a small breeze. As is his tradition, my father read Goodnight Moon to his granddaughter, as he had during his visits to the hospital. As is my tradition, I brought a rose from the bush we planted with her placenta in the garden of our aunt and uncle. 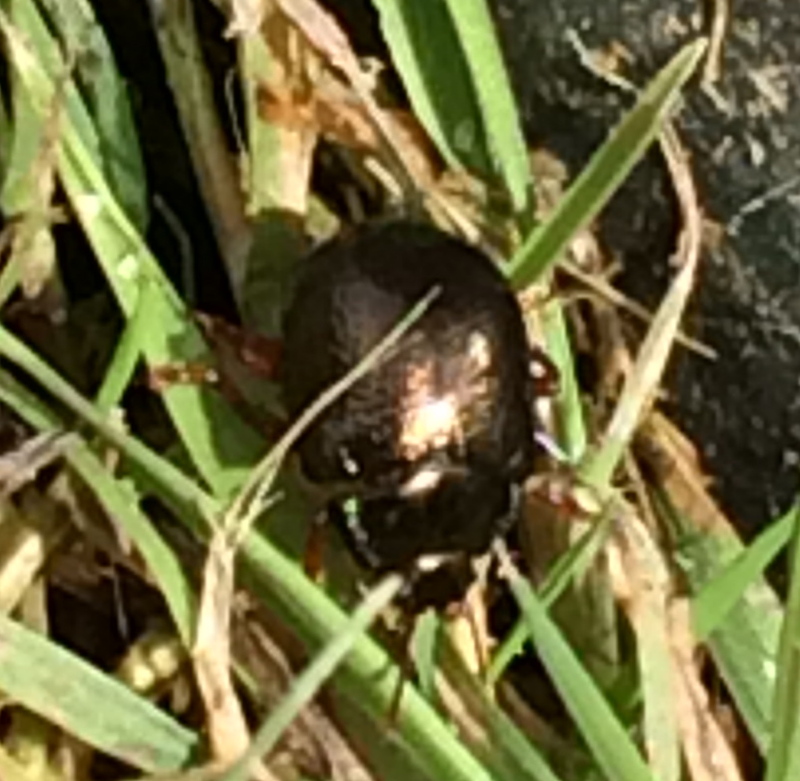 There was a golden beetle taking a walk around the base of her headstone, like the scarab that represented eternal life in the tombs of ancient Egyptian kings. My father told me the most beautiful story one day when I was with him. It had been a tiring day for him, but the grandchildren playing around him – my daughter and son and niece – brought light and peace. At one point we sat down together, away from the busy-ness, and he asked, “Do you want to hear a story?” His dark eyes got incredibly clear and focused and he started. It was a love story from when he was 21 years old, on his way from Greece to Israel. It was the mid-1960s and a romantic and revolutionary time to be moving to a kibbutz in Israel. He told me about a young woman he met on the ferry who lived with a disease she’d had her whole life. He didn’t remember what exactly, but it required ongoing care and blood transfusions. He saw her just a few times after they arrived in Israel, then fell out of touch. Listening, I marveled at the clarity in my father’s eyes, which had seemed tired earlier that day. His words came easily as he told me this long and beautiful story, more easily than they come sometimes because of the Parkinson’s he courageously lives with. I wondered why this experience had come back to him then, 50 years later. He spoke about this woman, this young love, as if with some regret that he had not done more to love her for a longer time. I reminded him that he didn’t know then what he knows now, that he was only 21 years old, barely out of his teens. There was such compassion in his telling, as if now he understood what it is like to live with a disease. I love my father more than the world. I always have. Without knowing it, he created for me from very early on my idea of the perfect man. Loyal and nurturing and dedicated and worldly and smart and soulful and handsome, so very handsome. He introduced me to westerns and science fiction, taught me history and politics and multiplication tables, brought me with him on planes to Europe, hung a basketball net above the garage for me to play with, brought me Playmobil and Legos and Kinder eggs from Europe on his business trips, took us to get donuts and sit on the roof of the car to watch fireworks on the Fourth of July, took me on a bike ride around town to teach me how to navigate using a map, helped me buy my first car. After my mother left him alone with two daughters when he was about my age, he did everything in his power to keep our lives stable. My father helped teach me what it means to love. It’s not easy to watch your parents age. It’s hard to do so without being hit with the thought that one day they will be gone. I know many who have already lost parents. During our visit back home, my husband pointed out to the extended family how much was the same as when he was a child, except that now we fill the shoes of our parents, and they fill the shoes of their parents, and the kids… well, they are the new generation who get to be the kids. The constant throughout time is the gaggle of cousins – this time ages two to eleven – playing together and chasing each other around the house; good and abundant food; and love. It’s the love that is eternal. I always cry when you write about sweet Tikva. This piece is very beautiful Gal-and very true. You are a remarkable woman and mother. Once again you break it down to the kernel of truth for all of us.